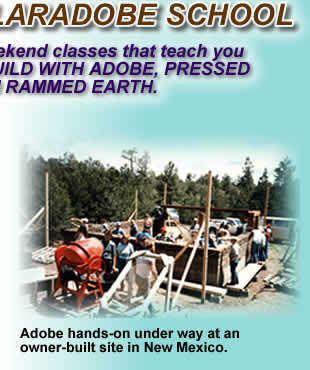 Southwest Solar Adobe School - Learn how to build with adobe. Details on adobe construction, green building, rammed earth construction, passive solar homes, solaradobe, and pressed block. Become an adobe home builder! Thirty years ago, Southwest Solaradobe (SWSA) classes began. The first was held in Peralta, New Mexico in 1978. Since that time, SWSA has conducted classes every year around the Southwest and in Latin America. SWSA has supported USAID with adobe-building assistance in Honduras and delivered presentations at the University of Costa Rica in San José. 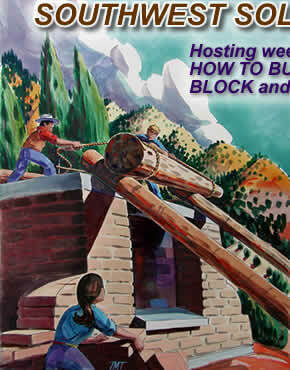 SWSA is active with the Earthbuilders' Guild towards the formation of better Earthbuilding codes and publishes Adobe Builder books about practical Earthbuilding. Concentrated classes, led by knowledgeable Earthbuilder/instructors, are necessary to remove misconceptions and clarify the code requirements. All classes are designed to be easily understood, requiring no advance preparation beyond your attention, good note taking, and if possible, a camera. Most offer Hands-on periods, during which students are encouraged to become familiar with tools and materials. 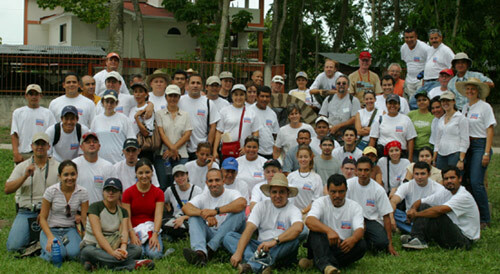 Class photo, San Pedro Sula, Honduras, July 27, 2005. This tropical class was advertised on the SWSA web site during the spring/summer season. Titled, " Earthen Construction in the Tropics", it was hosted by the office of Architect Angela Stassano and SWSA. Architectural students, engineers and architects from Honduras, as well as stateside builders attended. Hands-on and a great lunch were enjoyed at Lupita's plantel in Colonia Tara. The class was taught in English/Spanish with translator Carlos Assaf directing the translation at the Hotel Copantl. Hands-on at the plantel included cinva-ram, two hydraulic pressing machines and arch/wall construction.